Whew, what a ride. We wanted to make up for time lost in Fort Lauderdale and get to our old northern stomping grounds. So we screamed up the coast from South Florida to Orient NY in 3 weeks. 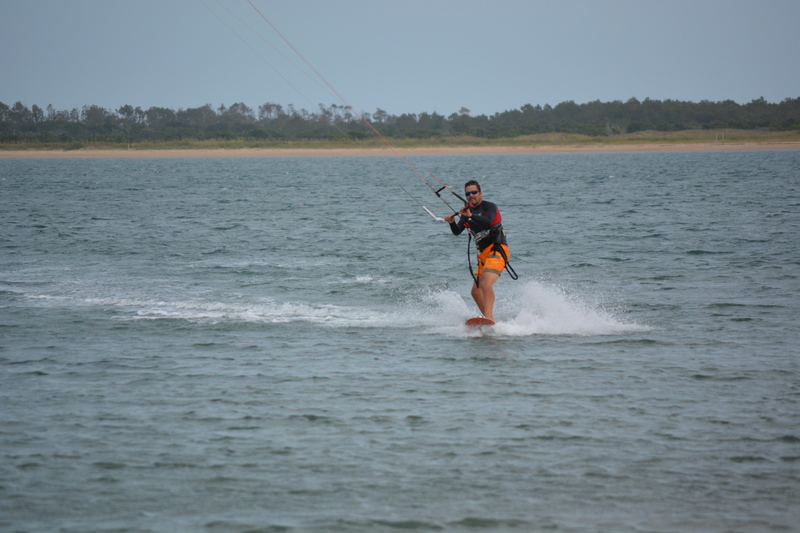 Along the way we dealt with some of the gnarliest capes that the US east coast has to offer. Although we were really moving, we enjoyed our time in Charleston. 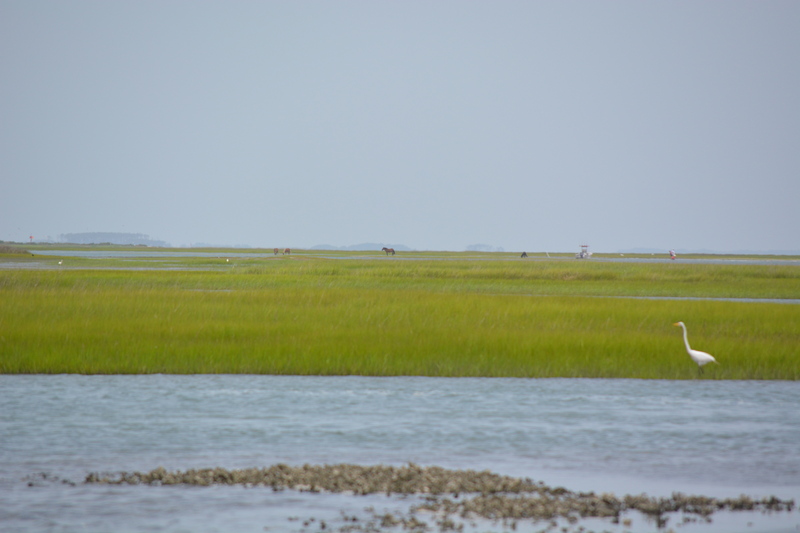 However, it ended all too soon and we were then on a 200 mile jaunt up to Cape Lookout. 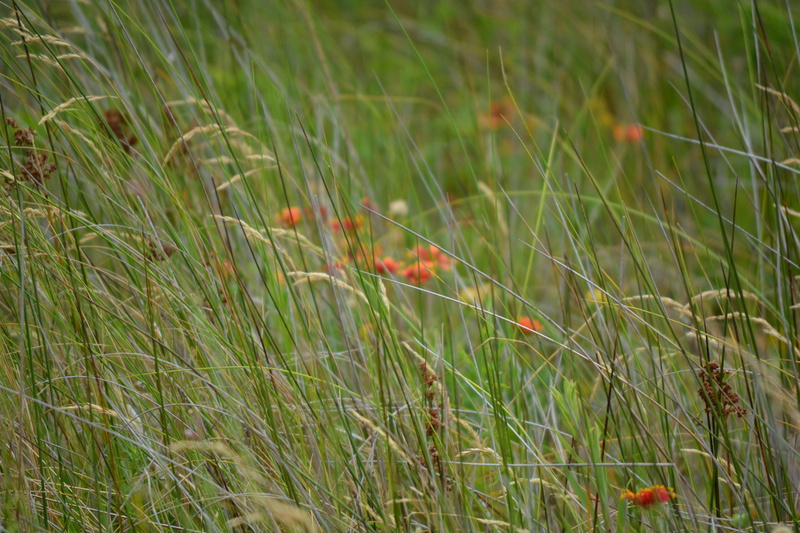 Lookout is a special place with a big circular bay nearly bereft of development. 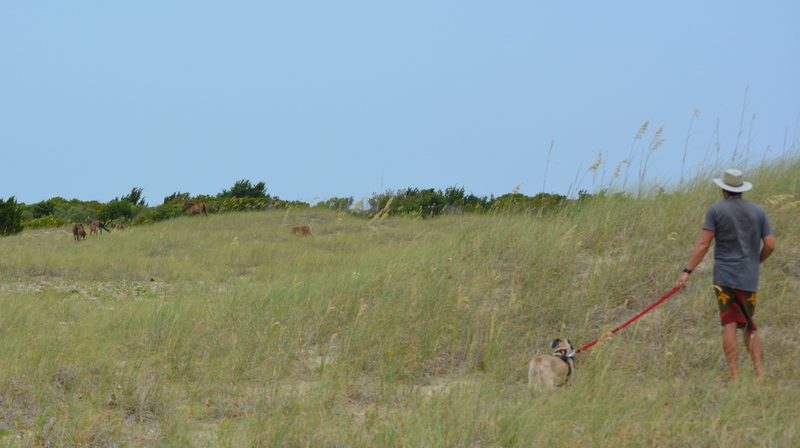 On the lookout for sharks during Mary’s dip in Cape Lookout. 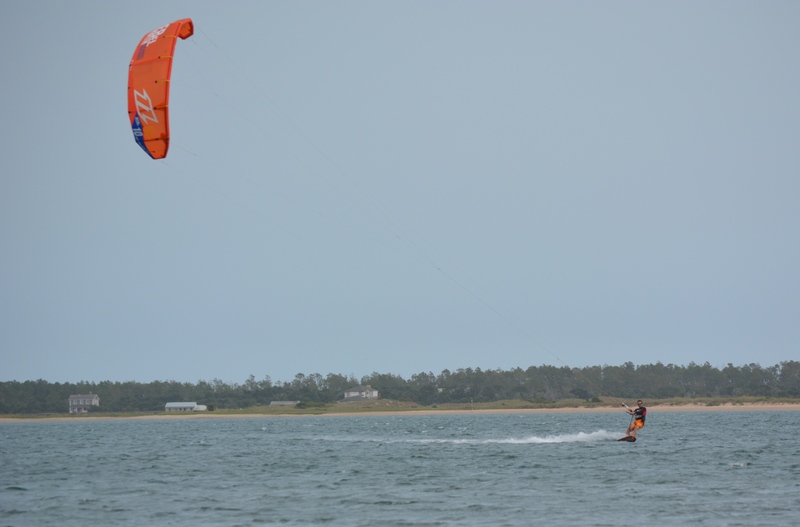 It’s a great place for kitesurfing (only wish we could have stayed longer). 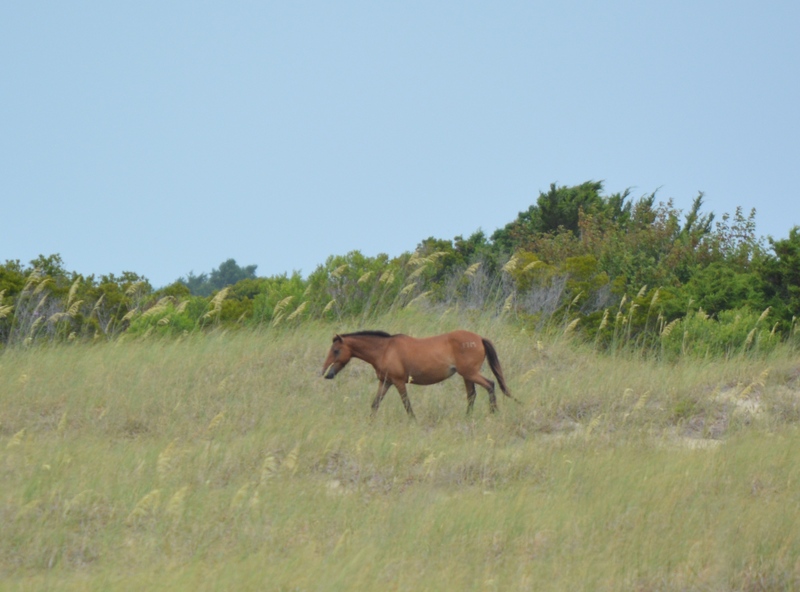 We also were able to swim in the water again (a little creepy because of all the shark attacks in the area) and we and R&R Kedger trekked out to spy on the wild horses living on Shackleford Banks. 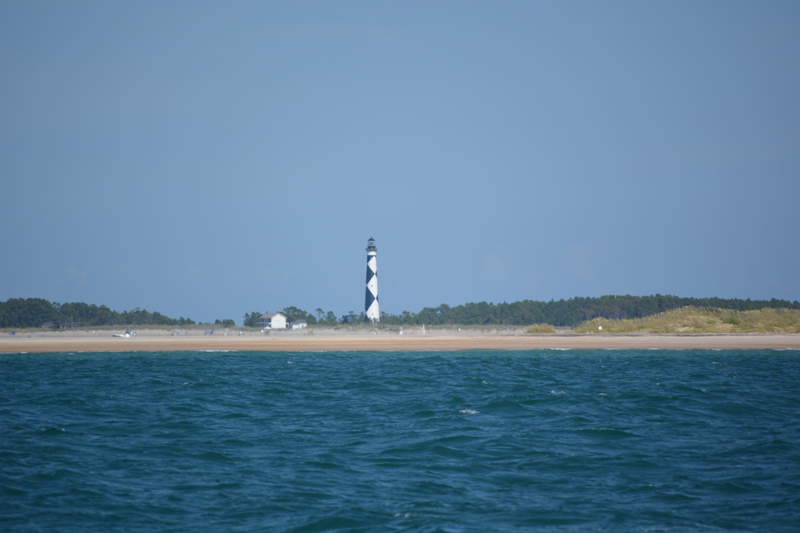 Cape Lookout is a wild and beautiful place, and we hope to return someday. 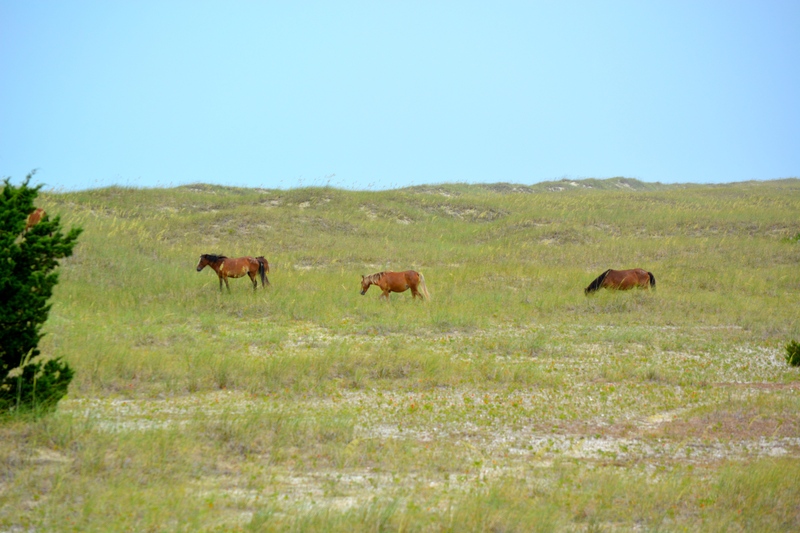 Our first sighting of the wild horses off in the distance. They don’t seem to mind if you don’t get too close. But we had a schedule to keep so we shot over to nearby Beaufort for one night to fuel up and hit the road the next morning. 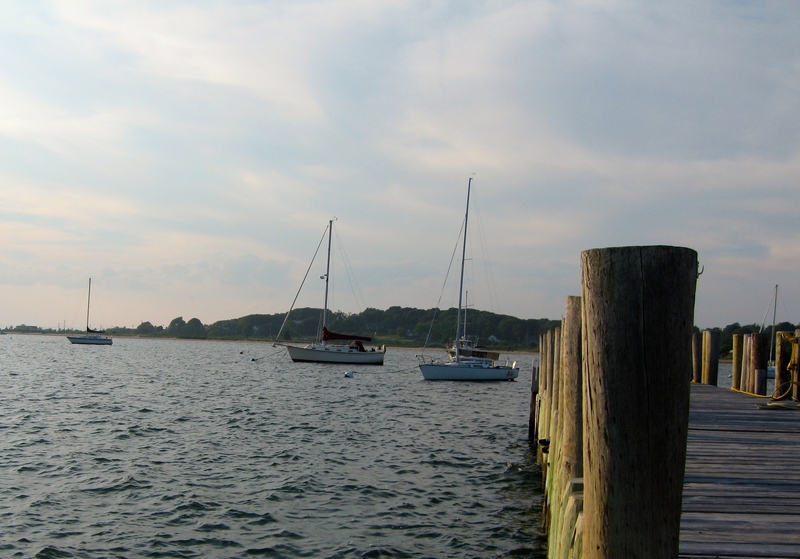 From what little we saw of Beaufort, we liked it. 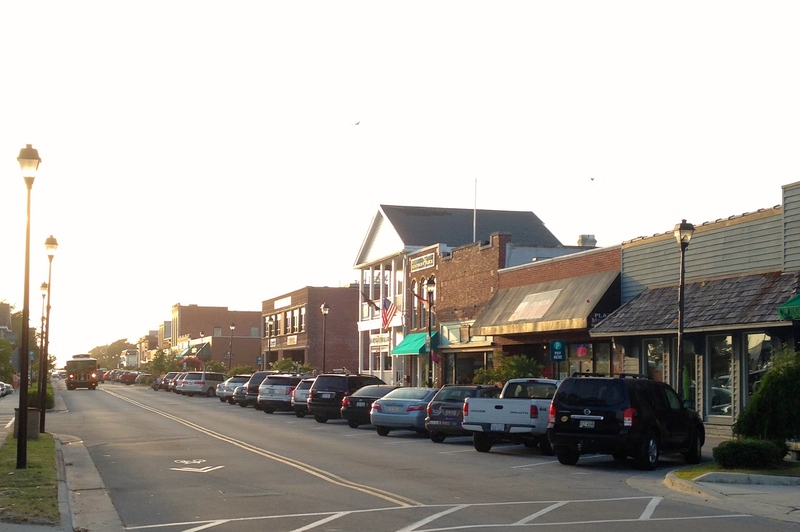 It’s a cute little old town making a living like so many places off the tourist dollar. It has a lot going for it with its preserved houses and beautiful nature just out the door. 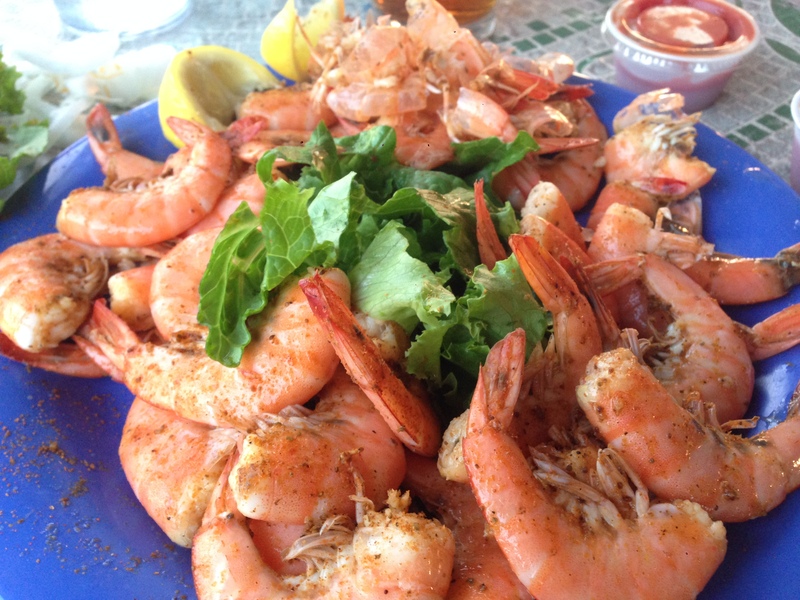 They know how to grow a delicious shrimp in the Carolinas. We had a decent weather window and would not have a good one again for a while. So we were presented with the choice of staying in Beaufort/Lookout for about a week to wait for the next window or moving out. With NY calling, we headed out into some of the worst seas we have ever been in. Lucky for us it was just the ocean swell built up from a week of 20 knot winds meeting the outgoing tide from Beaufort. It made for steep 10 footers which had Neko pointing at the sky and next at the deep. But once we got about 5 miles out the waves smoothed out a bit and we were able to turn to take them on the quarter. Life got better. 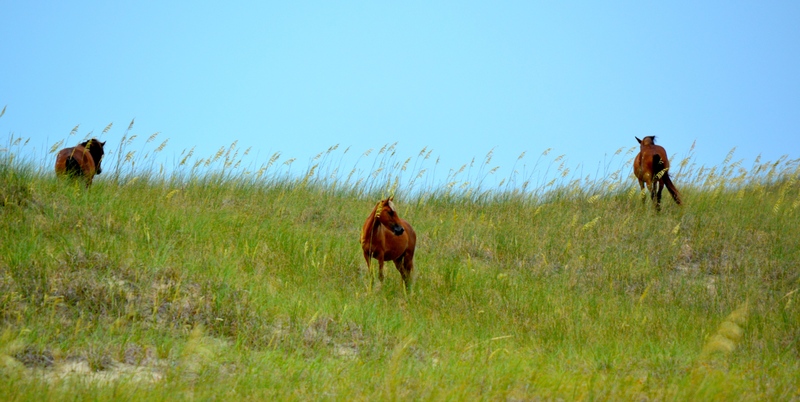 This leg would have us round notorious Cape Hatteras, the graveyard of ships. This is a treacherous cape that sees low pressure systems spinning off the coast as if being hurled out by the weather gods. They meet up with the Gulf Stream, which passes very close to Cape Hatteras, and often combine to create treacherous seas and nasty squalls. It’s not a place to trifle with. Lucky for us we had a good weather window and saw only brief periods of high winds and the lightning fireworks show stayed mainly inshore. And are we glad it did – at the point of the cape there were continuous lightning strikes onshore that were so visible and lasted so long it seemed like a colossal Frankenstein experiment. Breathing a sigh of relief as we left Hatteras behind, we set our sights on our next cape – Cape May in good old Joisey (leaving aside Cape Henry and Cape Charles, which we just passed in the night). Pulling into Cape May after 3 days at sea was such a relief. It was interesting to hear the accents on the VHF change from the slow southern drawl of South Carolina to the tighter drawl of North Carolina and Virginia to the oddly specific accent of those hailing from the Philly-Delaware-South Jersey axis. It is a sound I am very familiar with and knew we were back in home waters. However, it was just a quick stop. 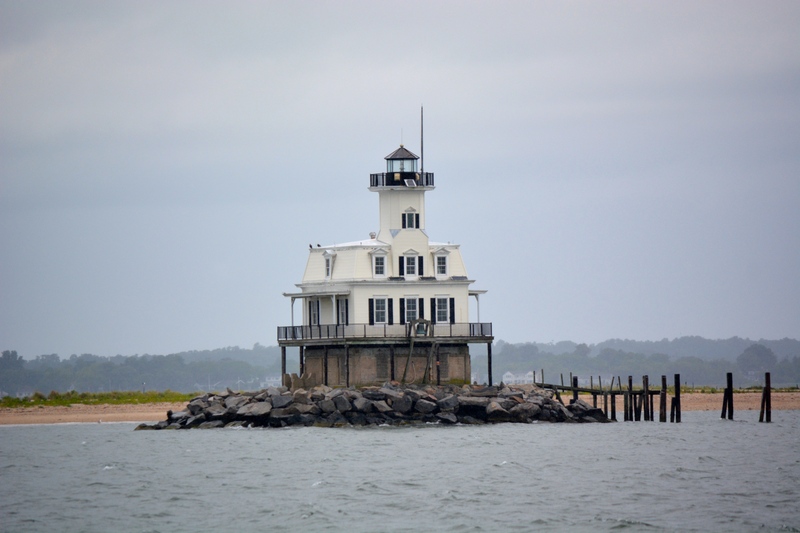 We headed out the next day for the 200 mile trip around Montauk Point (well, they could have called it a cape) and on into Orient Harbor for our long awaited arrival back in Orient. 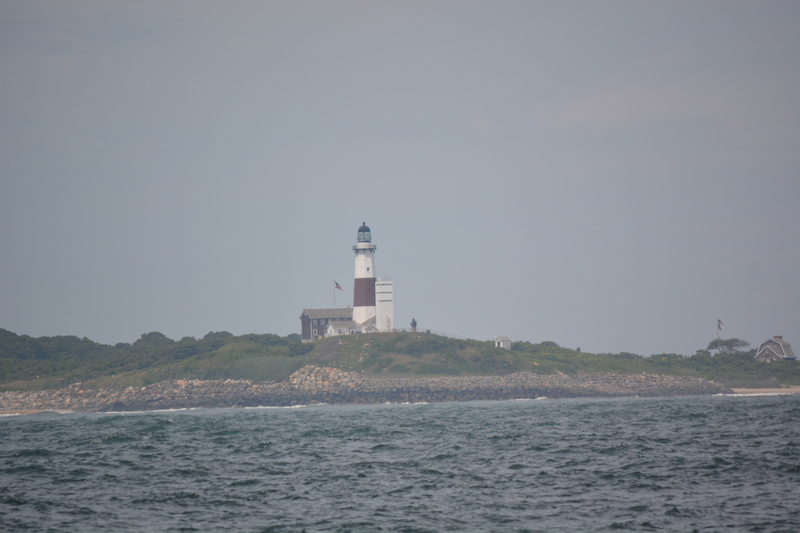 Happy to see the familiar Montauk lighthouse signaling us home. Catching blue fish left and right. Oh how sweet to again drop anchor in these familiar waters. The last time we did so was on Quint years ago but nothing ever changes in this place and it looks exactly the same. We don’t have a home any more, but this place feels as much like one as anywhere. 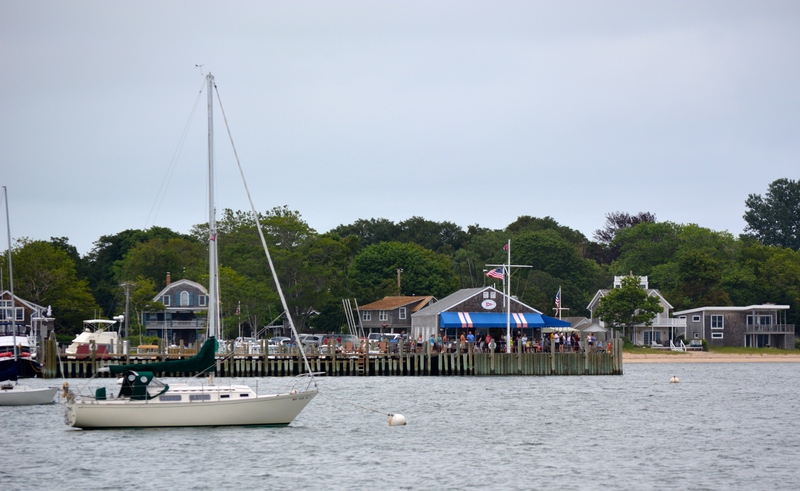 Our old Island Packet “Quint” moored in Orient Harbor in 2007. 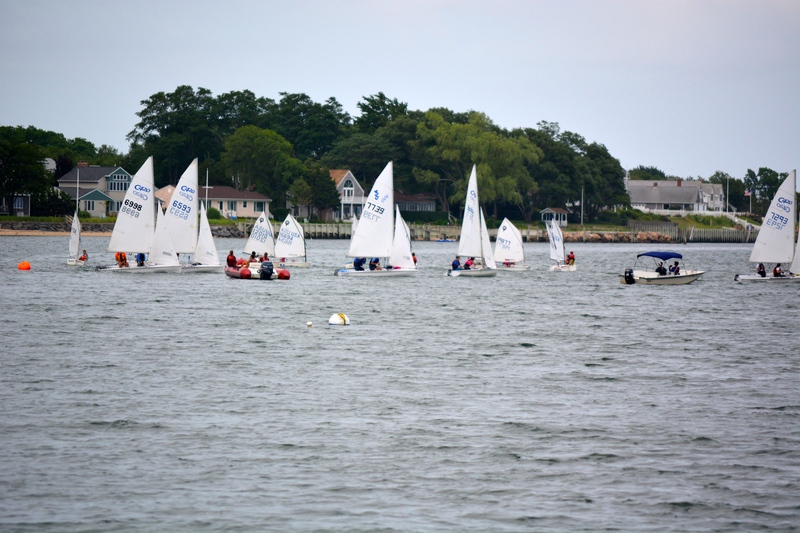 This entry was posted in 2nd Season, Sailing, USA, Wildlife by Pete. Bookmark the permalink. Glad you made it back to your home turf safely!